Money: we all need it, we all want it. But when is the right time to introduce kids to money? I think the answer to that question varies from family to family and kid to kid but, generally speaking, early is best. From a very young age kids can understand wants and needs, and money is the mechanism by which we acquire our wants and needs. A few months ago it became quite clear to us that David was ready to start learning about money and the responsibility that comes with it. For Christmas this year, David had created a wish list of all the toys and games and books and doo-dads that he wanted. Well, Christmas came and went, but the wish list kept growing. 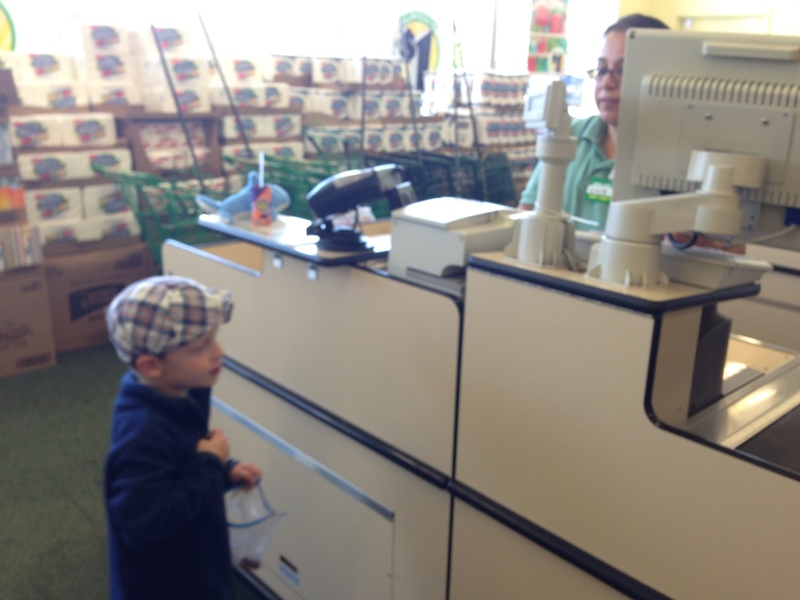 Every day–nay, every minute of every day–he was begging us to add more items to his “wish list”. The want, want, wants were getting out of control. We knew that it was time for an intervention, and the Allowance Jars were born. Since he is only 4 years old, we wanted David’s allowance to be pretty simple. We had three main goals with his allowance: to start teaching him the value of money, to encourage him to save some of his “income”, and to be generous with his “assets”. 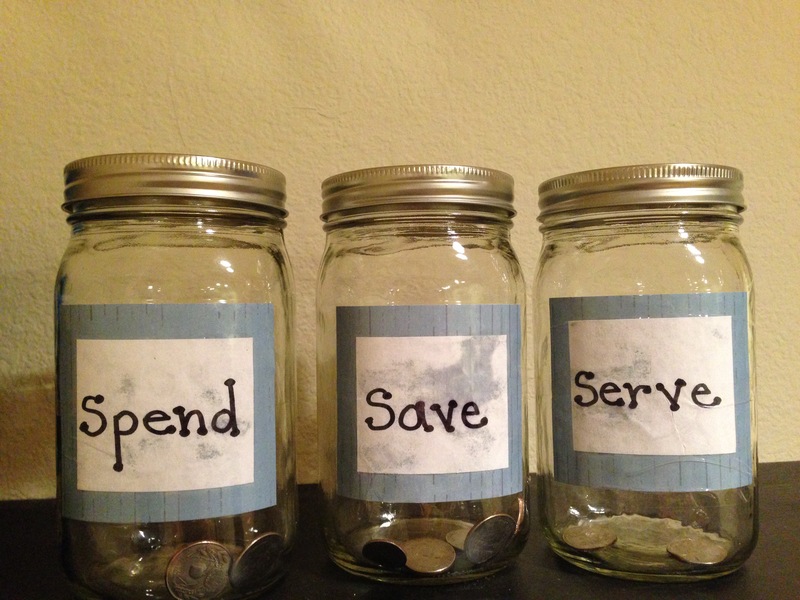 As a result, we decided to set up three jars, one for each goal: spend, save, and serve. To make the jars, I just cut slits in the tops of three mason jars. Then I printed off the labels spend, save, and serve, and I glued one label to the front of each jar. Each week we give David three quarters, one quarter for each jar, as his allowance. 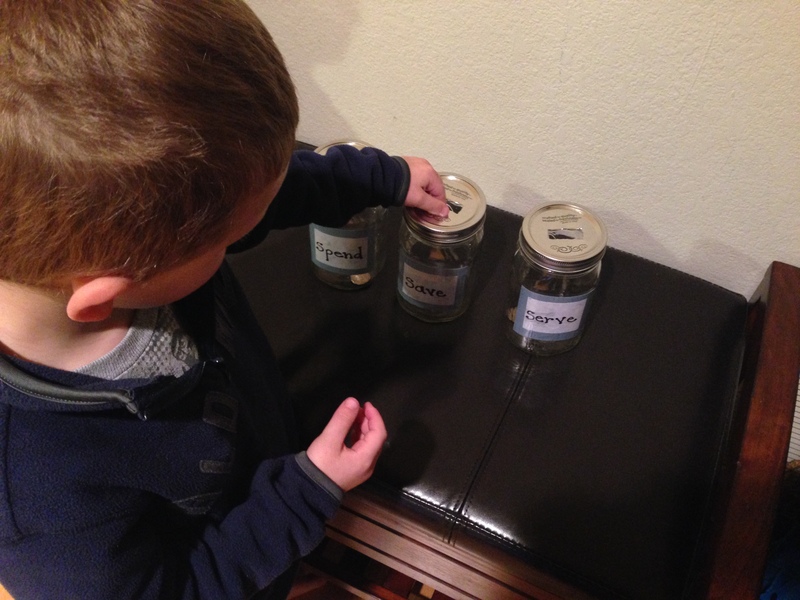 He puts the money into the jars himself so that he is learning the responsibility of tracking where his money goes. He is allowed to use the money in the spend jar whenever he chooses (usually a gumball from a vending machine or a trinket from the dollar store). This money never lasts long, but that’s fine! He’s learning what he can buy with his money and, as an added bonus, it’s cut down a lot on the gimme’s when we’re in a store (I just remind him that he can use his own money to buy that bright blue lollipop in the checkout line). I’ve also taken David on a couple of special outings with me specifically so he can go shopping with his money–he feels so grown up when he places his goody up on the check stand and pays for it all by himself! The serve jar is my favorite. Right now we have him bring the contents of that jar with us to church each week so he can put his money in the offering basket. As we’re packing up his coin to bring to church he always exclaims, “That’s the money I get to give to Jesus! That’s God’s money!”. As David gets older we’ll probably work with him to come up with more ways to use his “serve” money to be generous and help others, but for now he’s grasping a simple and wonderful truth. So, there you have it! Easy-peasy allowance that even a 4-year old (and their parents) can handle. My parents did the exact same thing with us and we will do it with Elise. We would save the “give/tithe” jar all year and use it for the reverse offering at church. It was always so much fun to buy toys and clothes for other children. 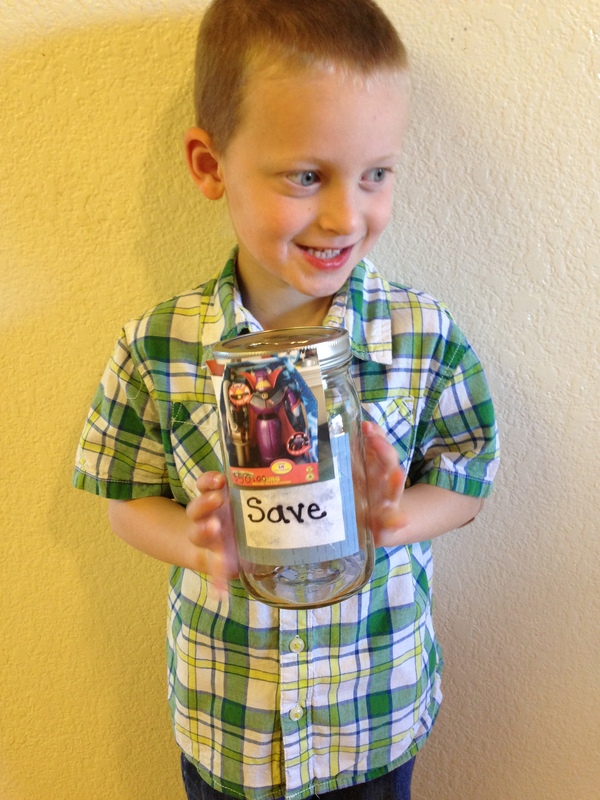 I love that idea about saving the give jar–we might have to try that, too!